Choosing to add large containers to the porch or patio requires careful thought about the best plants for these pots. Larger containers tend to have deep sides that literally swallow up the foliage of a small plant. Scale is important when choosing plants for large containers. Selections should be the same height as the container is deep to keep the correct proportion. Plants for large containers include annual and perennial flowers, as well as shrubs and small trees. Large containers require a commanding plant to fill the excess space. This plant produces a stunning flower on a tall spike shooting from large bright green foliage. Flower colors range from red to pink and various shades of yellow. 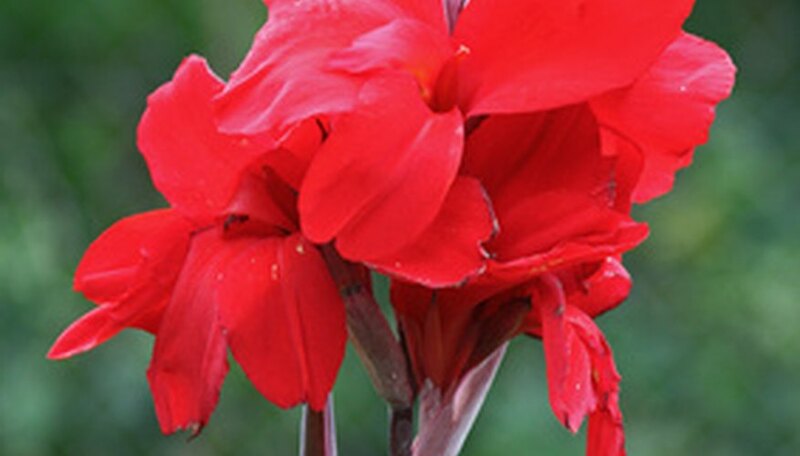 The canna lily will produce spikes that hold multiple flowers. The height of this plant makes it the perfect choices for a large container placed in a full sun location against the house. Plant bulbs 3 to 4 inches deep in the container and cover with loose soil. Water regularly and provide consistent moisture in the container garden. Provide regular fertilizer since potting soil nutrients leach quickly from new potting mediums. Potted canna lilies need protection during the cold winter months. Dig up the rhizomes and let the roots dry for three to four days. Clip back foliage to 2 inches and store in paper bags in a cool location. Pick a spot that doesn't experience freezing temperatures. The simplicity of an ornamental grass often provides the most suitable plant for a large container garden. Miscanthus grass features long plumes with feathery cream-colored flowers. Choose dwarf varieties for container gardens that reach mature heights of 3 feet tall. Miscanthus features variegated foliage of medium green mixed with cream or white stripes. This plant prefers full to partial sun locations. Miscanthus can remain in the pot through the winter, but does require some shelter from freezing temperatures around the pot. Bury the pot in the garden or mound hay around the pot after placing it against an east or west-facing wall. Juvenile plants look beautiful paired with flowering sun-loving annuals in a large container. The dwarf Alberta spruce is a pyramid-shaped evergreen suitable for large container gardens. The dwarf spruce features fine needle-like evergreen foliage in a compact shrub. Alberta spruce likes the full to partial sun location and has a very slow growth rate to limit the need for transplant. Mature plants can reach up to 10 feet tall. Provide consistent moisture in the large container for best growing results. Spin the plant regularly so all sides benefit from exposure if placed against a wall. Dwarf Alberta spruce never disappoint as a perfectly groomed specimen placed in the outdoor living space.